^ United Nations (8 July 1947). "Official records of the Second Session of the General Assembly". Archived from the original on 7 May 2015. Retrieved 20 Oct 2018. ^ Rezonville (1931-02-17). "VI. 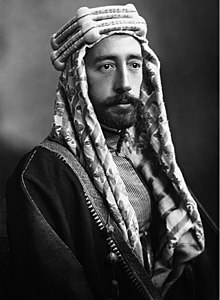 King Faisal I - First Issue, 1927 & 1932 - rezonville.com". Rezonville.com. Retrieved 2018-09-26. Masalha, N. (Oct 1991). 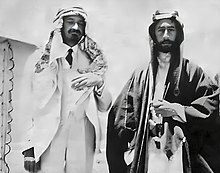 "Faisal's Pan-Arabism, 1921–33". Middle Eastern Studies. 27 (4): 679–693. doi:10.1080/00263209108700885. JSTOR 4283470. Simon, Reeva S. (Jun 1974). 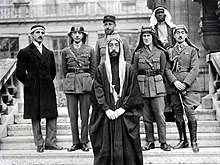 "The Hashemite 'Conspiracy': Hashemite Unity Attempts, 1921–1958". International Journal of Middle East Studies. 5 (3): 314–327. doi:10.1017/s0020743800034966. JSTOR 162381. 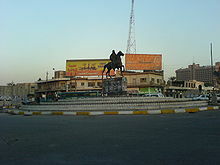 This page is based on the Wikipedia article Faisal I of Iraq; it is used under the Creative Commons Attribution-ShareAlike 3.0 Unported License (CC-BY-SA). You may redistribute it, verbatim or modified, providing that you comply with the terms of the CC-BY-SA.